We were both born and raised in Dallas. My mom (Delaney) is one of seven children and had four of her own (one being me- Ann Catherine)! Needless to say family is the # 1 importance and aspect that shapes our lives. Both of us have grown up with creative spirits, which naturally lead us to obtaining Art degrees in our college careers. Both of us also have art gallery experience – My Mom co-owned a gallery in Dallas which represented Dallas artists such as Melissa Auberty, Sonya Edwards and a few other current Bee Street artists, and I worked in the gallery and art community in Charleston SC before moving back to Dallas after college. When and why did you open Bee Street? Bee Street opened in 2015. In the beginning, our little “hidden gem” for great art was only known about through word of mouth, but organically grew into what it is now with the support from both our community of clients and community of artists who have either been with us from the beginning or quickly and eagerly jumped on board to be a part of our growing business. The concept was to have a place where original art could be purchased in a non-intimidating and very personal atmosphere. We really love helping clients find what they are looking for – or didn’t even know what they were looking for! They come to us with their criteria (budget, size, ideal style or look) and we go from there. It’s really fun and rewarding and we love every minute of the process. How has Bee Street changed throughout the years? The biggest change has been our roster of artists. It started off with about 5-8 and now Bee Street represents over 80 selectively curated artists from all over the country. Our artists are the backbone of Bee Street and have been amazingly supportive in our growth. It was a huge risk to sign on with an unknown gallery (in the early years), but they trusted our business model and more importantly us, to show and sell their artwork throughout Texas and our teamwork still proves to be successful and the business is growing daily. What is your favorite part about owning an art gallery? Oh gosh – where do we start?! The people. Our artists and clients both. We have developed so many wonderful relationships whether it is through working with clients or working with artists. Purchasing original art is a big deal both personally and financially. We understand this and want to help make the process as smooth and FUN as possible. I am happy to report that our clients are always satisfied at the end of the process. If there are any bumps in the road, we make it right. It is absolutely imperative for us that there is ZERO buyers remorse. On the artists side, we strive to make their roles as simple as possible so that they may do what they were born to do : CREATE ART. Our job is to be the middle man and hopefully sell as quickly as they can create! BUT the MOST FUN part about our day to day is opening up the boxes and getting the first looks of beautiful selected pieces that are shipped from our artists. We often say everyday is like Christmas around here, and it is – for our clients! What makes you different from other galleries? Two things that make us different from other galleries are: the way that we display the artwork, and how we have been able to get the artwork in front of as many people as possible through our road shows. We describe Bee Street as a warehouse style gallery. This is because our Dallas location is an actual warehouse building and we use as much wall space as possible to display the work. We make a commitment to our artists to represent them to the best of our ability and we do so by having their artwork on the walls at all times. Adding to our commitment, we take Bee Street on the road to other cities in Texas. We have partnered up with interior designers and storefronts in various cities to be able to showcase our artists to entirely new sets of eyes in different communities. 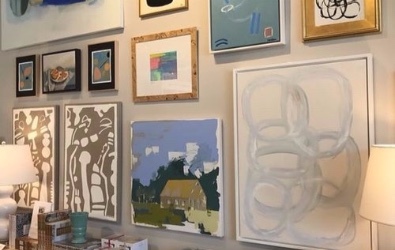 We have developed longstanding relationships with clients and we enjoy re-connecting with them when we return with new pieces and artist alike. 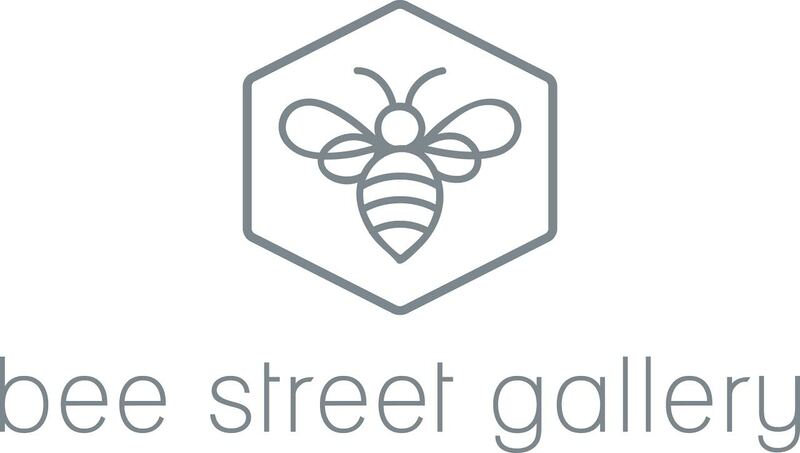 You recently changed the name to bee street gallery, tell us a little about this decision. We made this name change simply to clear any confusion about who we are and what we do. Most people refer to us as “Bee Street” anyway, and with the opening of our Fort Worth location, we found this to be a good time to clear up any of the confusion before the expansion! We had our Grand Opening last Thursday and it was so fun and an awesome turn out! I live in Fort Worth (Ann Catherine) and it has always been on the radar to be able to expand into the community here. My sister, Delaney Jr., also lives here so you will see the three us of rotating from Dallas to Fort Worth pretty often. This location is a bit different in that we will be able to host more events here because the layout is more accessible for people to gather. We will also be having individual and group artist shows here – so be sure to mark those dates on your calendar as they arise! Hours of operation for FW are Tuesday – Friday 10am – 4pm. @blayne_art . Follow me HERE! How long have you been with Bee Street Gallery? How long have you been a working artist and selling your work? Blayne Beacham Macauley is a painter in Atlanta, GA. She studied Plein Air oil painting in Venice Italy at the Scuola Internazionale di Grafica and Studio Art at Boston University. She uses symbols to create abstract paintings, which represent exact moments in her life. 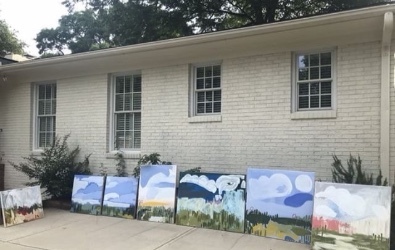 Her work has been featured in Atlanta Homes & Lifestyles, Southern Living and Southern Seasons Magazine. What is your favorite medium to work with? Why? Acrylic paints, oil pastel, pastel, and oil sticks. I do a little interior design on the side... meaning when my close friends and family move into new spaces I just force myself into the project and insist they consult me on all major decisions. Lastly, please update us on what is going on right now in your world? Who have you collaborated with? What praises can we share? I have my first ever solo show at Anne Irwin Fine Art opening Oct. 5th! Take a look at Blayne's work! @adeleyonchakart . Follow me HERE! After many years in the corporate world and having my first two children I decided to finally use my art degree professionally in early 2015. Having moved a few times as a child I was raised in Southwest Virginia, Eastern Tennessee and the North Carolina Piedmont. Always the creative, I really got the art bug senior year of high school and went on to earn a degree in both Business and Studio Art at Hollins University. 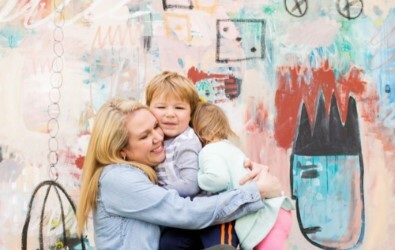 My husband and I were married in 2008 and I had my children in 2011, 2013 and 2017 respectively. I never thought I would use my art degree professionally but am so glad I took that plunge. I work primarily with heavy body acrylic and a palette knife. While my formal training was in oil, I've learned to love the fast drying process of acrylic and it allows me to work quickly and layer texture that suits my creative style. I love to read and at one point in my life I dreamt of being a novelist until I tried to start a book and realized how hard it is! 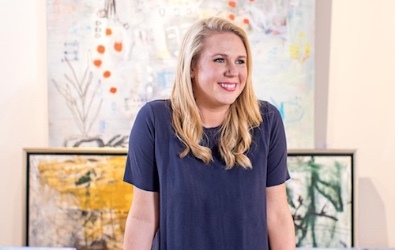 I exhibit in multiple galleries in the South East and have had success with national design brand partnerships like Schoolhouse Electric and Serena & Lilly. Take a look at Adele's work!